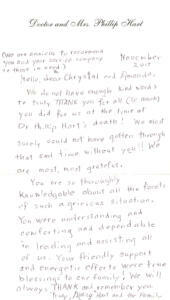 We do not have enough kind words to truly THANK you for all (so much) you did for us at the time of Dr. Phillip Hart’s death! We most surely could not have gotten through that sad time without you!! We are most, most grateful. You are so thoroughly knowledgeable about all the facets of such a grievous situation. You were understanding and comforting and dependable in leading and assisting all of us. your friendly support and energetic efforts were true blessings to our family! We will always THANK and remember you. P.S. We are anxious to recommend you and your service company to those in need.